How often should I bathe my Goldendoodle? How can I make my Goldendoodle smell better? It is normal to want to buy the best shampoo for Goldendoodles when you own this beautiful hybrid dog. Our guide today will help you make the best decision. A Goldendoodle is a hybrid dog – a mix between a Golden Retriever and Poodle. This popular designer breed can be mistaken for a purebred dog because they have become increasingly common and popular, but Goldendoodles are, in fact, a hybrid/mix breed. They are intelligent, active dogs with mesmerizing fluffy coats. You should brush them on a weekly routine, and bath them on an as-needed basis. Now, what are the Best Shampoo for Goldendoodle dogs (and conditioners)? A Goldendoodle’s skin has moisture and natural oils that are important and help maintain a healthy coat. If bathed too often, your Goldendoodle can and will lose some of these essential moisturizing elements, which will leave their coat and skin, dry. This is why many owners opt for the best natural shampoo for goldendoodles. Here’s what you must consider when choosing a shampoo for your Goldendoodle. Goldendoodles look so much like big teddy bears, and they demand only a high-quality shampoo to penetrate their thick coat. At the bottom of all those luscious curls lies a sensitive skin, so your Goldendoodle will need a dog shampoo that is gentle on the skin. You’ll want to buy a shampoo with effective moisturizing to lock in your dog’s natural oils. Before bathing your Goldendoodle, brush them out and trim their hair as you like. Use a pick to detangle any areas of concern, and rid the coat ofany matted fur. We talked about more on how to give a Goldendoodle a bath later in this post. So, you can scroll down to read it. Goldendoodles can be sensitive to chemicals that potentially exist in certain shampoos. It’s vital that you chose a natural or limited-ingredient shampoo to prevent your doodle’s skin from getting irritated. Using a two-in-one shampoo will help you comb through tangles and knots to give your doodle a healthy, fluffy look. Overall Best Goldendoodle Dog Shampoo: Buddy Wash makes a rangeof shampoos that are great for bathing your Goldendoodle. The mint and rosemary formula is a two-in-one shampoo and conditioner made from natural ingredients. The botanical extracts and essential oils extracts create a rich lather to thoroughly clean your doodle’s coat and leave it looking soft an shiny. This natural dog shampoo is also infused with tea tree oil and aloe Vera to soothe itchy, irritated, or dry skin. Pros: Coconut-based and alcohol-free mean that bath time for your Goldendoodle will be soothing. The wheat protein element will deodorize your doodle if they’ve gotten into something unsanitary. 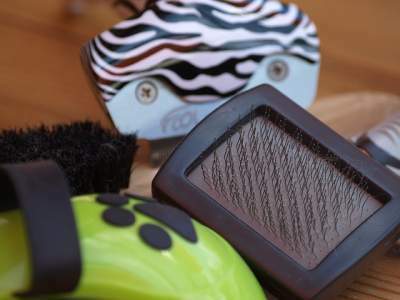 Buddy Wash shampoos are made in the USA and are safe for frequent use if necessary. Cons: This Buddy Wash shampoo lack antimicrobial properties. Best Shampoo for Goldendoodles With Sensitive Skin: If you would like an 100% organic shampoo for your Goldendoodle, this one is perfect for you. Paws & Pals Oatmeal, Shea Butter & Aloe vera formula is created for dogs with dry or sensitive skin. The natural oils this contains moisturize the skin, and gently soothes any itching or pain related to dryness or fleas. Paws & Pals is made from vegan, all-natural ingredients, making it perfect for your Goldendoodle’s coat care routine. Pros: This shampoo is non-toxic and soap-free. It helps detangle your dog’s fluffy fur. Even if this shampoo gets in your doodle’s eyes, it won’t cause irritation or harm. Made in the USA. -Water, glucoside, colloidal, serum, jojoba oil, Aloe Vera gel, oatmeal, kelp, glycerin, coco, and vitamin E.
Best Shampoo for Goldendoodles with Allergies: If your Goldendoodle suffers from allergies or get irritated easily, Dr. Harvey’s which offers an herbal dog shampoo which is organic, chemical-free and all natural will fix it for ya. If your doodle have allergy-prone skin, Dr. Harvey’s with help soothe and moisturize it with a blend of essential extracts and oils. Your dog deserves a healthy, shiny coat, and Dr. Harvey’s Herbal Dog Shampoo can help with its phosphate-free and paraben properties. With this shampoo, you can rest easy knowing that your Goldendoodle isn’t being subjected to perfumes, chemicals, or dyes. Pros: Free of chemicals, parabens, dyes, detergents, and phosphate. Hypoallergenic, eco-friendly and biodegradable. Great for dogs of all ages. The Dr. Harvey’s brand is known for making trustworthy pet products you can always count on. Still wonder why this is #3 on our ratings of the best shampoo for Goldendoodles? Because your Goldendoodle does not need frequent baths, a waterless shampoo can beneficial. Rather than subjecting your doodle to a bath and potentially causing them to lose lose their coats moisture and natural oil, you can use this waterless shampoo spray. All you have to do is spray this pH balanced formula onto their coat and massage thoroughly. Simply towel dry them afterwards and you’re done! Your doodle will look all clean! The honey and apple in Burt’s Bees waterless shampoo help to promote shiny, healthy fur. For gentle, soothing deep cleaning, Zesty Paws features an excellent cost-effective option. This shampoo is formulated with different vitamins, guinoa, aloe vera, and almond extract, which will leave your Goldendoodle’s coat feeling clean and soft. Zesty Paws dog shampoo will moisturize your doodle’s sensitive skin, and vitamins D and DEwill relieve irritation from hot spots. Oatmeal properties in this shampoo will create a protective, moisturizing layer on your dog’s skin. Zesty Paws oatmeal anti-itch shampoo is effective for Goldendoodles of all ages. If your Goldendoodle has light colored fur (as most do), you’ll want to keep their coat looking brigt and beautiful. Earthbath Light Color Coat Brightening shampoo is coconut-based and contains optical enhancing minerals to clean stains and lift dirt for your doodle’s precious coat. Because this shampoo is paraben-free, it will add some extra shine to your Goldendoodle’s fur via a natural blend of ingredients. Want more ideas? 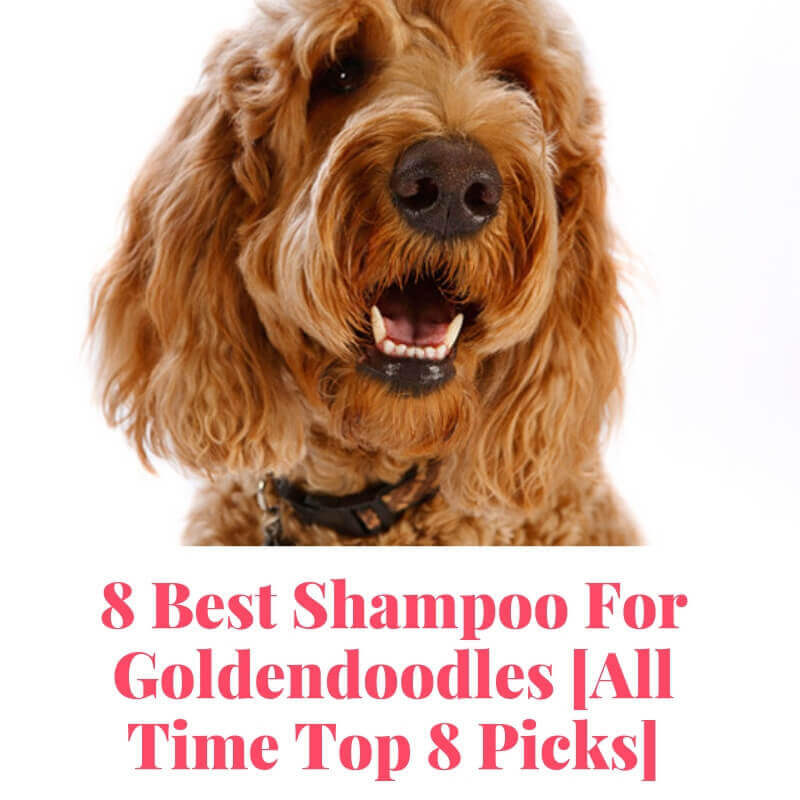 Continue reading more on best shampoo for Goldendoodles…. This Bodhi dog oatmeal Shampoo is a top recommended shampoo for Goldendoodles. It soothes and moisturizes dry and itchy skin. This product has a botanical-based formulation that contains natural and high-quality proteins, vitamins, coconut, Aloe vera, and fruits extracts. These ingredients provide a cooling and calming relief to damaged skin. This shampoo is a combination of baking soda and oatmeal that washed irritated skin and relieve your pet from itching and carting, without damaging skin and keeping dog clean. This Oatmeal dog shampoo is one of the best shampoos you can use for your pets especially if they have allergies or sensitive skins. Because of its natural ingredients, it does nto contain any toxic or alchohol substance, making it safe for puppies and Goldendoodles. This product provides coat and skin care for other pets such as ferrets, horses, rabbits, and cats. It keeps the coat and fur soft and shiny. This certain product has a light apple scent that makes your bathing time enjoyable and pleasing to the nose. Bodhi dog oatmeal Shampoo is a top pick for Goldendoodles. This product gives relief for itching, sensitive, and scaling skin with its oatmeal and Aloe Vera formula. It is no wonder it made our list of best shampoo for goldendoodles. This gentle shampoo is great for dogs with sensitive or allergic skin. Healthy Breeds Oatmeal Dog Shampoo has a d=safe formula that uses flea control treatments. IT even has a Pina Colada scent that keeps your dog clean and fresh. This product is a high-quality shampoo with oatmeal that is natural to use. It can moisten your dogs’ skin and coat. Healthy Breeds Oatmeal Shampoo for Dogs with Aloe Vera is a soap-free combination with vitamins and oatmeal to discharge itchy and dry skin. This hypoallergenic shampoo serves as a natural cleanser and washes the skin without harsh irritating substances that may come in contact with your pet. It leaves the coat clean, smooth and manageable and it helps restore natural moisture on your dog’s fur. This hypoallergenic shampoo acts as a natural cleanser and washes the skin without harsh irritating substances that may come in contact with your pet. Health Breeds Oatmeal Shampoo is super safe to use even with frequent washing. It does not strip your pet’s coat. And we come to the end of the list of best shampoo for Goldendoodles. To make sure the bathing process is easier and smoother; you should prepare all the materials you will need. Ensure all you need is within your reach so you don’t have to leave the room. Plus, you should have extra towels on hand just to be sure. To begin, select the right shampoo your dog will love as it makes the bathing process more fun. 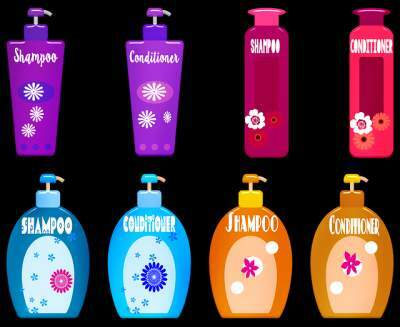 It is necessary to choose a shampoo that is mild, pH balanced, and safe for our dogs. Before bathing your dog, work hard to remove the mats and tangles to prevent them from solidifying. Make sure your dog is completely wet before shampooing. Then begin to work from his/her neck down to tail. It is vital that you do not allow the product to touch your dog’s eye as it may lead to irritation. Once your pet is all tidied up, you rinse him with running water to make sure no shampoo remains on his skin. Use extra towels to dry your Goldendoodle. If that doesn’t work, you can turn on the blower, but make sure that it is no too hot as this may cause burns to your pets. Goldendoodles only need bathing on an as-needed basis. You should avoid the temptation of bathing your doodle more often than every six weeks or so. Their curly coats don’t shed, but they can become matted and tangled if not brushed about once a week. Follow the tips below to give your Goldendoodle the best bath experience you possibly can. Your Goldendoodle’s bath time will be much more pleasant if you rid their coat of mats and knots before bathing. Use a fine tooth pick or comb to do so. If you don’t pick out mats before bathing your Goldendoodle, it can further exacerbate the matting. Trim or Shave whatever excess hair before bathing your Goldendoodle, if necessary, of course. Pour a line of shampoo from the back of the ears to the tail of your dog. Lather their coat in a single direction, as ruffling their fur can cause knots and tangles. Warm up a towel for drying by putting it in the dryer for about 10 minutes. A warm towel always feels good after bath time even on humans! Goldendoodles got their non-shedding feature from their Poodle genes. Ideally, Goldendoodles should be bathed very six to eight weeks. Over-bathing can lead to irritated and dry skin. Goldendoodles already have sensitive skin, so bathing them too often will lead to skin conditions or irritations. If the smell of your Goldendoodle does not please you, try using a more fragrant shampoos. You can also use natural deodorizing sprays between baths. If you discover that spray and different shampoos aren’t helping and your doodle still smells, they may have a health condition. Pay your vet a vsiist if your Goldendoodle continues to stink despite changes in bah time routine. Goldendoodles are very lovable pets.To take care of them properly, you need to consider things that would help you maintain their maximum health and happiness such as deciding which shampoo to use. Since their coats and furs are very visible, it is important to take care. When your pet gets used to a bathing routine, it can quickly become an adorable and enjoyable bonding and experience. This may take patience and time but once you get to it, the happiness you’ll get will all be worth it. If you groom your Goldendoodle yourself, make sure to my post on the best brushes for Goldendoodles and also the best dog clippers for matted hair.